Blacksmith working metal with hammer on the anvil in the forge. hammer forging hot iron at anvil. 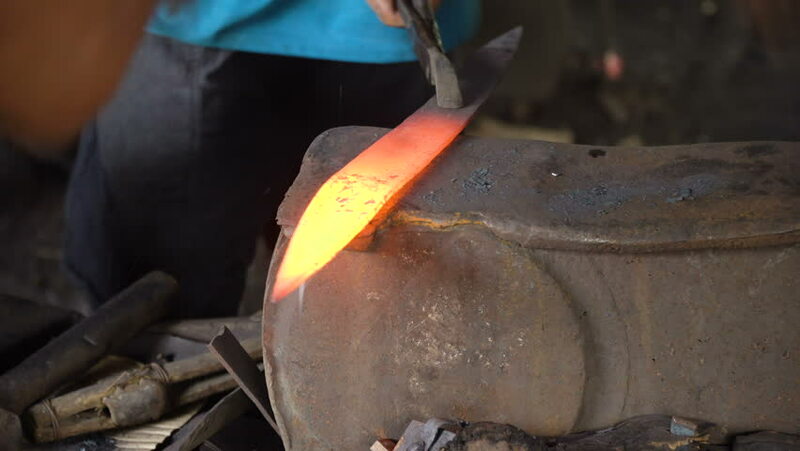 Blacksmiths make machete. Hands of the smith by the work. 4K video, Philippines. 4k00:09Blacksmith working metal with hammer on the anvil in the forge. hammer forging hot iron at anvil. Blacksmiths make machete. Hands of the smith by the work. 4K video, Philippines. hd00:20Female cooks preparing cheese pies and stacking in casserole in kitchen, close up. Women cooking traditional food. Chef curling crust for cheese pie and stacked in baking dish. 4k00:06Hand applying varnish pant. Yellow lacquered metal. How to polish aluminum.